Dear Labby: Why Does My Dog Carry His Food To The Other Room To Eat It? I’ve noticed that my dog does something odd during meal time. After I fill his bowl, he’ll scoop some food into his mouth, run out of the kitchen, drop the food on the living room rug, and eat it there. It seems like an extra step in the eating process, and I don’t know why he wouldn’t just save time and effort by eating the food where I put it. It also makes a crumby mess on the rug that’s rather unpleasant to step on. Does he have something against his bowl? Is he ashamed of eating in the kitchen in front of his humans? Are we doing something to make him uncomfortable? I’m no Michelin chef, but I want to make sure I’m giving my dog the best eating experience possible. I’m just worried that I’m doing something wrong and causing this behavior. Please help. 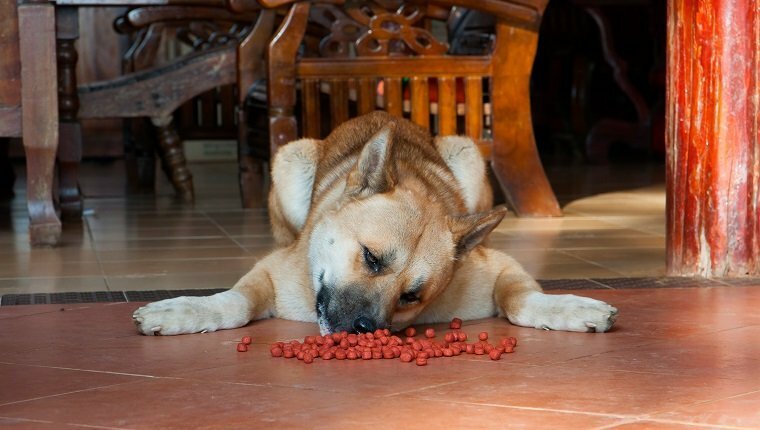 There are several reasons that your dog might choose to dash and dine rather than dine and dash, and for the most part, it’s probably not your fault. Dogs, like humans, can have all kinds of quirks when eating, especially if they are uncomfortable, stressed, or anxious. The good news is that there are some problems you may be able to address and steps you can take to reduce the chances that you’ll be walking on a crumb-covered rug after every meal. The first thing you should do is rule out the obvious: is there a problem with the actual bowl, itself? Your dog’s bowl may be dirty and full of off-putting smells, especially if it held some food that your dog didn’t like recently. Try washing your dog’s bowl and see if that makes it more appealing. Plastic bowls and bowls that are cracked or damaged also tend to harbor bacteria, even when they are washed. 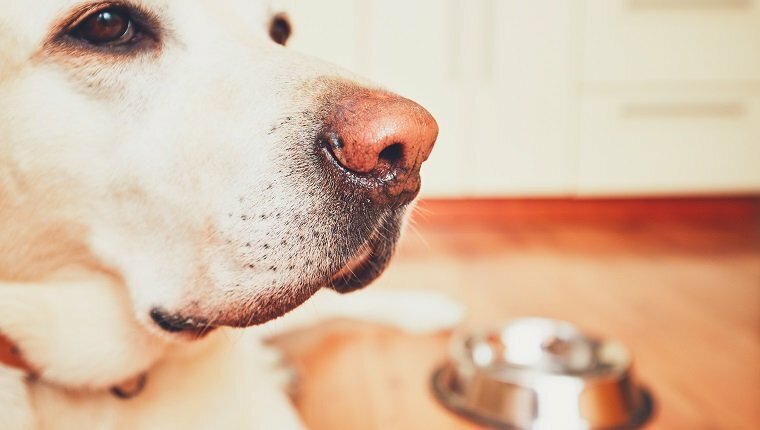 Those bacteria may be causing your dog to turn his nose, too, so it might be time to replace the bowl with a new one that isn’t broken or made of plastic. Just FYI, there are plenty of reasons plastic isn’t the best choice for a dog bowl, so keep that in mind. Watch your dog when he takes food from the bowl, and pay attention to the tags on his collar. Do they clink against the bowl when he tries to eat? If they do, the noise may bother or frighten him. You could try removing his collar during meal time; just remember to put it back on afterward. You might also want to try a bowl made out of a less noisy material. A ceramic bowl may be a better choice than metal, for example. If the bowl isn’t the issue, the surface that your dog stands on while eating may be the problem. Some dogs have trouble gaining traction on hard, smooth surfaces like you would usually find in a kitchen. The rug may provide firmer footing. I’ve noticed this especially with senior dogs who may have a bit of arthritis, as it takes a lot of effort for them to stop their paws from sliding out from under them while they bend down to eat. You may want to try putting your dog’s bowl on or next to a rug that won’t slide. I did this for one of my senior dogs who had trouble standing while eating. 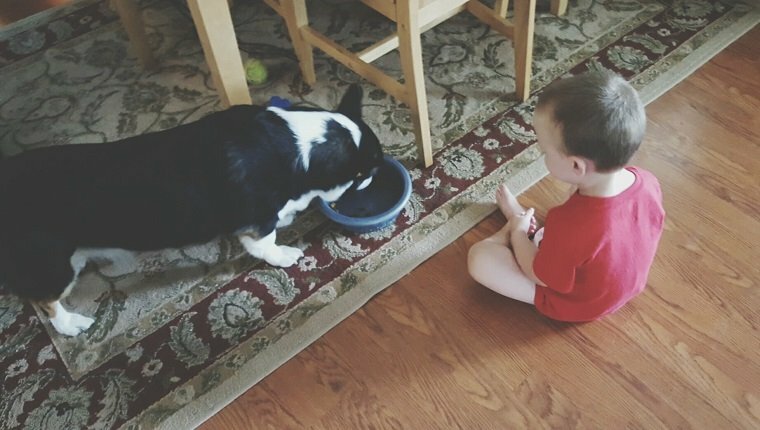 He had a much easier time eating on the rug, and because the bowl was right there, he wasn’t spilling crumbs all over the place. If your dog doesn’t have an issue with the bowl or the floor, the problem may actually be something instinctual. In the wild, canines hunt and eat in packs. In order to avoid fights, some dogs take their portion of the kill away from other dominant pack members to avoid fighting. Your dog may not have a reason to think you’re going to fight him for his food, but he is just acting on instinct. If you have other dogs in the house, he may also feel a direct sense that he has to guard his food from competitors. Try giving your dog his own safe space to eat without any humans or other animals present. He may feel less stressed during meal time. It’s also important to pay attention to when your dog is eating in another room. Does he only bring his food to the other room when his humans are there? If that is the case, he may want to just be with his family and feel lonely if he’s the only one in the kitchen. He may feel a bit of separation anxiety and want to be a part of the pack. 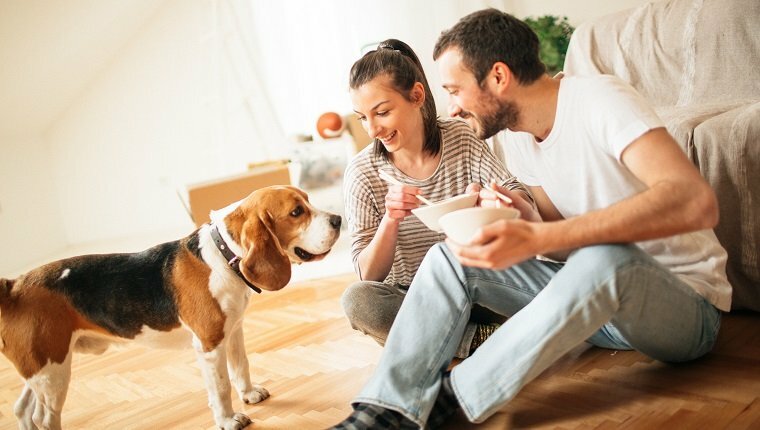 Try staying with your dog in the kitchen while he eats, or just consider moving his bowl to the room where your human family is spending time. So, F.I.N.E. 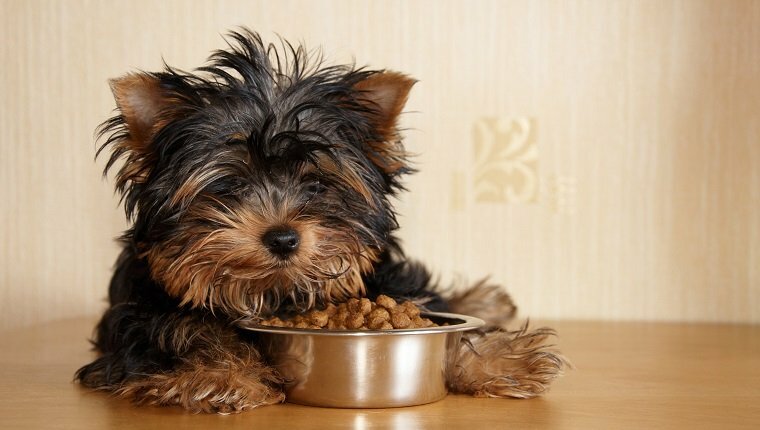 D.I.N.E.R., understanding why your dog feels the need to have an out-of-bowl dining experience may help you take steps to make sure dinner time is as stress-and-mess-free as possible. Your dog will feel more comfortable, as will your feet now that they’re not stepping on bits of half-chewed dog food. Does your dog take their food out of the bowl to eat? How do you make your dog feel comfortable during meal time? Let us know in the comments below, and leave any questions you have for Dear Labby!